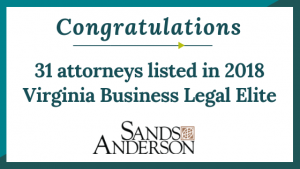 RICHMOND, VIRGINIA — Thirty-one Sands Anderson PC lawyers are listed among Virginia Business magazine’s 2018 Virginia Legal Elite, firm president Margaret F. Hardy reported today. The Legal Elite are selected by votes of other lawyers across the state. 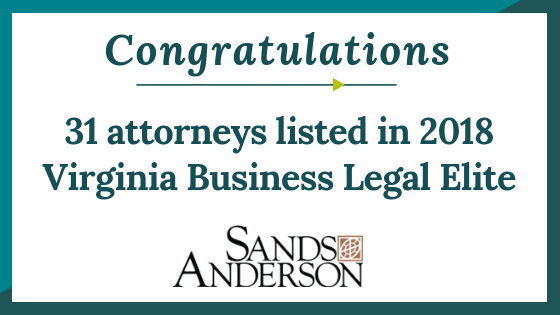 Sands Anderson PC is a Mid-Atlantic law firm that guides clients with united support for their complete legal needs. As a consultative ally, we represent businesses, government entities, insurance companies, healthcare organizations, and individuals from our six offices located throughout Virginia and in North Carolina. We are a true team of legal professionals committed to a collaborative and inclusive workplace, as well as supporting the economic growth of the communities where we operate. For more information, visit http://www.sandsanderson.com.